Xiaomi participation in Consumer Electronics Show [CES 2017] Las Vegas ensured that they want to go into 2017 as one of the top tech companies. First they unveiled white version of Mi Mix, the Xiaomi’s concept phone which was launched last year and then they launched Mi Router HD. Now they have also unveiled Xiaomi Mi TV 4. Checkout Xiaomi Mi TV 4 price, release date, availability details and everything about it here. The Mi TV 4 is the latest 4K smart TV with virtually no-bezel as the thickness of it is just 4.9 mm. It features artificial intelligence system known as Patch Wall which can predict content based upon what you have watched or searched. 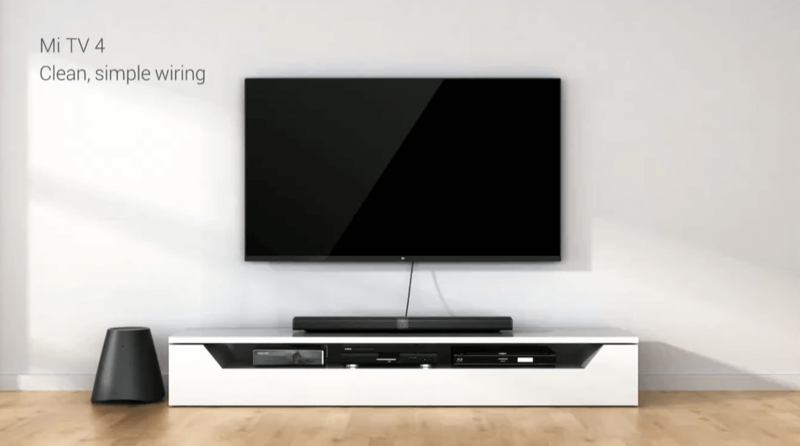 It has a modular system that separates it from any other Smart TV in the world. It takes on Samsung and LG’s SmartTVs with price being an important factor. The Price of 65 inch Mi TV 4 is said to be $1999. The 59 inch & 49 inch Mi TV 4 price isn’t known yet. The Xiaomi Mi TV 4 will be very soon available for purchase in China. Launch outside China isn’t known yet.